Khonsu was the Egyptian god of the moon and fertility. Egyptian gods and goddesses closely resembled the appearance of humans, but many of their gods, such as Khonsu, were also perceived as 'human hybrids' depicted with human bodies with the heads of birds or animals. The symbol of Khonsu was the falcon which was used as a recognition aid and a device to visually convey the powers, identity and attributes of the god. Egyptian Name: Khonsu. Alternative Names: Chons, Khons, Chonsu, Khensu, or Khonshu. His name means "wanderer"
Titles: "Khonsu, the chronographer" and "Khonsu the Merciful"
Khonsu, the Egyptian god of moon, featured in the stories, myths and legends in Egyptian Mythology. His symbols were crescent and full moon, the falcon, a crook, flail, and scepter. Although best known as a lunar deity he was also associated with healing. According to ancient Egyptian mythology he was credited with healing the pharaoh Ptolemy IV who subsequently took the epithet "beloved of Khonsu who protects the king and drives away evil spirits". Khonsu was often depicted as a child and revered as a protector of children against dangerous animals and represented standing on crocodiles. Ancient Egyptians appealed to him as 'Khonsu the Merciful' for help when they were ill. 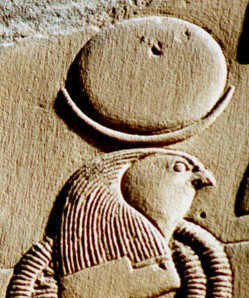 The duties of the ibis-headed god Thoth included that of secretary of the sun god Ra and scribe of the Underworld and Khonsu was perceived as his mathematical counterpart. The Egyptians appreciated the regular cycles of the moon, and made them the base for their calendar of twelve months making up a lunar year. Khonsu was therfore described as the pendulum of heaven and the precise divider of months and had the epithet of "Khonsu, the chronographer". Khonsu was a member of the three gods referred to as the Triad of Thebes. 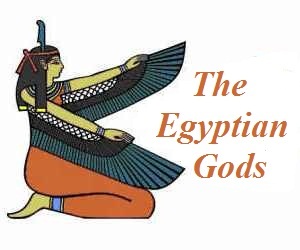 The sacred Triad of Thebes consisted of Mut, the vulture goddess of the sky, the mighty Amun god of the air, sun and the sky and their son Khonsu. Temples and shrines dedicated to the worship of the three gods in the Triad of Thebes existed throughout Egypt, however their cult center was at Karnak, part of the ancient city of Thebes (Luxor), with its massive temple complex. Major construction work on the massive temple complex during the Eighteenth dynasty of the New Kingdom (1570 BC - 1070 BC), when Thebes became the capital of the unified Egypt. Khonsu was also one of a triad of gods with Sobek and Hathor called the Triad of Kom Ombo. The worship of the gods in the Triad of Thebes was halted temporarily by the edicts of the pharaoh Akhenaten, the father of Tutankhamen. Akhenaten started a religious revolution in Egypt by banning the worship of all gods including Khonsu, in favor of just one god - the Aten. During this period the Pharaoh Akhenaten used the Egyptian military to destroy the old religion and all of its gods. He also tried to destroy the powerful priesthood of the Triad of Thebes. The Temple at Karnak in Thebes and dedicated to the triad of gods was closed, the priests were thrown out and Akhenaten ordered the statues of the old gods to be destroyed. The religious revolution lasted for 16 years from 1349BC - 1333BC until the abdication and death of Akhenaten. The worship of the Triad of Thebes including Khonsu was re-established and grew into even greater prominence in ancient Egypt. The Temple of Khonsu is located in the large Precinct of Amun-Re at Karnak, in Luxor, Egypt. The Temple of Khonsu iwas originally constructed by Ramesses III (1184 BCE to 1153 BCE), on the site of an earlier temple. The gateway to the temple was at the end of an avenue of ram headed sphinxes, the symbol of Amun, that ran to the Temple of Amun. Ptolemy III Euergetes constructed a great gateway and enclosing wall for the temple but only the gateway now remains. The Khonsu Temple The temple contained not only a suite of rooms for the housing of the statue of the god, but also a separate barque chamber. The statue of Khonsu, along with statues of Amun and Mut, were conveyed by boat from the temple of Karnak to the temple of Luxor, a journey of about 2 miles, during the Opet festival, in order to celebrate the marriage between Amun and Mut. Discover interesting information and research facts about Khonsu, the Egyptian god of the moon and fertility. The facts about Khonsu provides a list detailing fascinating additional info to increase your knowledge about Khonsu in Egyptian Mythology. 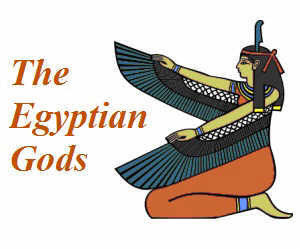 Fact 2: He was the son of the god Amun and the goddess Mut. Together, the three gods were called the Triad of Thebes. Fact 4: As a god of fertility Khonsu was believed to make the plants grow and for women to conceive. Fact 9: Taweret, the hippopotamus goddess, as "Opet," had small temple near the 'House of Khonsu' at Karnak.